Not to be confused with spider crab. See List of Thomisidae genera. Rationalisation for the name crab spider is generally subjective and anecdotal. It is commonly said to refer to a fancied resemblance to crabs, or to the way such spiders hold their two front pairs of legs, or their ability to scuttle sideways or backwards. Some spiders so called have bodies that are flattened and angular. At all events, the Thomisidae are the family most generally referred to as "crab spiders". However, some members of the Sparassidae are called "giant crab spiders", the Selenopidae are called "wall crab spiders", and various members of the Sicariidae are sometimes called "six-eyed crab spiders". Some unrelated orb-weaver spider species such as Gasteracantha cancriformis also are commonly called "crab spiders". Such names are of little biological significance, and the following emphasis is on the Thomisidae. Thomisidae do not build webs to trap prey, though all of them produce silk for drop lines and sundry reproductive purposes; some are wandering hunters and the most widely known are ambush predators. Some species sit on or beside flowers or fruit, where they grab visiting insects. Individuals of some species, such as Misumena vatia, are able to change color over a period of some days, to match the flower on which they are sitting. Some species frequent promising positions among leaves or bark, where they await prey, and some of them sit in the open, where they are startlingly good mimics of bird droppings. 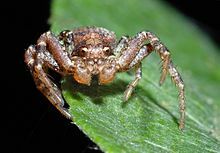 However, these members of the family Thomisidae are not to be confused with the spiders that generally are called bird-dropping spiders, not all of which are close relatives of crab spiders. Other species of crab spiders with flattened bodies either hunt in the crevices of tree trunks or under loose bark, or shelter under such crevices by day, and come out at night to hunt. Members of the genus Xysticus hunt in the leaf litter on the ground. In each case, crab spiders use their powerful front legs to grab and hold on to prey while paralysing it with a venomous bite. The spiders of Thomisidae are not known to be harmful to humans. However, spiders of an unrelated genus, Sicarius, which are sometimes referred to as "crab spiders", or "six-eyed crab spiders", are close cousins to the recluse spiders, and are highly venomous, though human bites are rare. Several different types of sexual dimorphism have been recorded in crab spiders. Some species exhibit color dimorphisms; however, the most apparent dimorphism is the difference in size between males and females. In some species, this is relatively small; females of Misumena vatia are roughly twice the size of their male counterparts. In other cases, the difference is extreme; on average, female Thomisus onustus and Misumena vatia are more than 60 times as massive as the males. Several hypothesized explanations are given for the evolution of sexual size dimorphisms in the Thomisidae and other sister taxa. The most widely acknowledged hypothesis for female growth is the fecundity hypothesis: selection favors larger females so they can produce more eggs and healthier offspring. Because males do not carry and lay eggs, a growth in size does not confer a fitness advantage. However, sexual size dimorphism may be a result of male dwarfism. The gravity hypothesis states that the smaller size allows the male to travel with greater ease, providing him with an increased opportunity to find mates. Females are comparatively stationary and a smaller size provides them no additional benefit. Other hypotheses propose that sexual size dimorphism evolved by chance, and no selective advantage exists to larger females or smaller males. Thomisus female with male on back awaiting opportunity to mate, probably when she next feeds. Note the shape of the distal ends of his pedipalps. ^ "Family: Thomisidae Sundevall, 1833". World Spider Catalog. Natural History Museum Bern. Retrieved 2015-10-30. ^ "Currently valid spider genera and species". World Spider Catalog. Natural History Museum Bern. Retrieved 2015-10-30. ^ "Flower (a.k.a. Goldenrod) Crab Spider (Misumena vatia)". Woodland Park Zoo. Retrieved 2015-10-30. ^ a b Corcobado, G.; Rodríguez-Gironés, M.A. ; De Mas, E. & Moya-Laraño, J. (2010). "Introducing the refined gravity hypothesis of extreme sexual size dimorphism". BMC Evolutionary Biology. 10: 236. doi:10.1186/1471-2148-10-236. PMC 2924870. PMID 20682029. ^ Hormiga, G; Scharff, N; Coddington, J.A. (2000). "The Phylogenetic Basis of Sexual Size Dimorphism in Orb-Weaving Spiders (Araneae, Obiculariae)". Systematic Biology. 49: 435–462. doi:10.1080/10635159950127330. ^ Head, G (1995). "Selection on Fecundity and Variation in the Degree of Sexual Size Dimorphism Among Spider Species (Class Araneae)". Evolution. 49: 776–781. doi:10.2307/2410330. ^ Head, G. (1995). "Selection on Fecundity and Variation in the Degree of Sexual Size Dimorphism Among Spider Species (Class Araneae)". Evolution. 49: 776–781. doi:10.2307/2410330. ^ Corcobado, G.; Rodríguez-Gironés, M.A. ; De Mas, E.; Moya-Laraño, J. (2010). "Introducing the refined gravity hypothesis of extreme sexual size dimorphism". BMC Evolutionary Biology. 10: 236. doi:10.1186/1471-2148-10-236. PMC 2924870. PMID 20682029. ^ Prenter, J.; Elwood, R.W. & Montgomery, W.I. (1998). "No Association between Sexual Size Dimorphism and Life Histories in Spiders". Proceedings of the Royal Society of London B: Biological Sciences. 265 (1390): 57–62. doi:10.1098/rspb.1998.0264. PMC 1688762. Wikimedia Commons has media related to Thomisidae.